The mammoth wasp is the largest wasp you will encounter in Malta or, for that matter, anywhere in Europe. It belongs to a family of wasps known as scolid wasps and, in fact, is also known as the large yellow-banded scolid wasp. About 200 species are known to exist in the world, most of which are predators of beetle larvae. Some are important biocontrol agents. The female mammoth wasp can grow up to 40mm or 45mm in length. Males are smaller, reaching a maximum of 30mm. It is a very conspicuous insect, seen from late spring to early autumn, especially in valleys and garigue areas with wild artichoke (qaqoċċ tax-xewk) plants growing in the vicinity. I have also seen them on the large pink flowers of the kaffir fig (xuxet San Ġwann). Only females have stings, and these are used mainly to paralyse the white larvae of Europe’s largest beetle – the rhinoceros beetle. She then lays a single egg in the larva’s body. When the egg hatches, the wasp larva starts to feed on the larva’s internal tissues. It eventually kills it and continues eating it until nothing is left but an empty skin. When fully grown, the larva forms a cocoon and emerges in spring when the air has warmed up sufficiently. 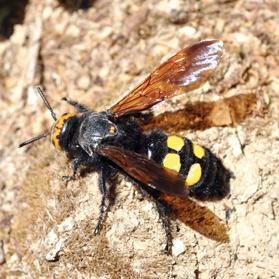 In Maltese the mammoth wasp is known as qerd iż-żaqquq. Qerd is Maltese for destroyer but I could not find the meaning of żaqquq. I assume that as this wasp kills the larvae of the rhinoceros beetle, żaqquq could be a lost name for this insect which nowadays is known as buqarn kbir.